Visiting Seoul, South Korea’s eclectic and bustling capital, doesn’t have to be an expensive experience. There are plenty of things to see and do for free (or on the cheap) that will keep you busy whether you’re on a shorter visit or a longer stay. The city offers a great balance between the modern and the historic, as well as cheap (and delicious) street food, enough parks and green space to make it easy to spend time outdoors and an efficient and affordable public transit system get you where you need to go. So, find your flight (Cheapflights.ca can help) and get ready to start exploring with the best cheap and free things to do in the city. Once you arrive in Seoul, get yourself a T-Money card, which can easily be purchased from most convenience stores, including those at the airport. The card costs an initial 2500 won (around $2.85) and can then be loaded with more money depending on how long you’re staying. The card works on buses and subways throughout Seoul and districts beyond and makes for a cheap and easy way to get around when you’re not on foot. Some taxis also accept T-Money cards, but ask before you take a ride. If you’re looking for a scenic way to see the city on foot (at no cost), make some time to walk the old city wall, originally built in 1396. You might not get around the whole thing as it’s nearly 19 kilometres long, but a walk on the wall means you get Instagram-worthy views of Bugaksan Mountain, Naksan Mountain, Namsan Mountain and Inwangsan Mountain. Located in north-central Seoul in the neighbourhood between Gyeongbokgung Palace and Changdeokgung Palace, this area has a large concentration of ‘hanoks’ (traditional Korean homes). There are around 900 hanoks here and though many are still private residences, many more have been converted into cafes, art galleries, shops and tea houses. If you don’t want to spend any money, just go to explore and take in the historic atmosphere. If you do have some cash to spare, stop in a tea house or café to relax and people watch. There are also several hanok guesthouses here, which make for a unique place to rest your head during a visit to Seoul. 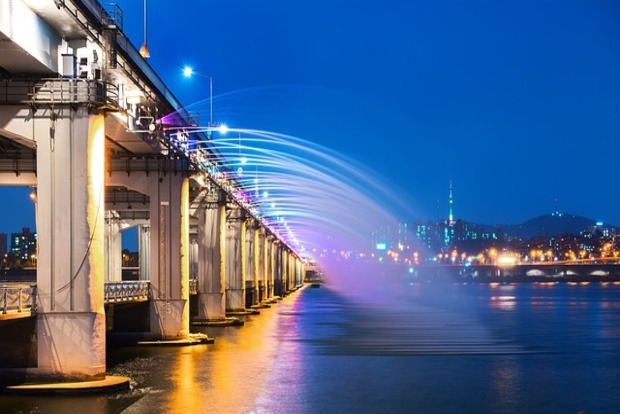 Banpo Bridge Rainbow Fountain, the longest bridge fountain in the world, is found on Banpodaegyo Bridge and features 380 nozzles spraying water from the river below into a display of water, light and music that happens several times a day. The show is especially beautiful at night when 200 coloured lights illuminate the flowing water. 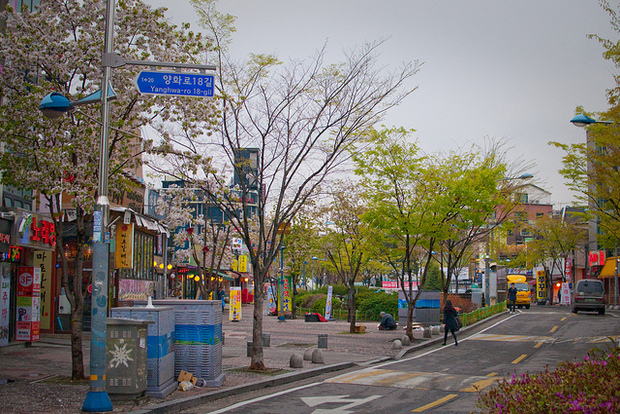 This neighbourhood in Seoul surrounds Hongik University and, being a university-centric area, there are an abundance of bars, cafes, art galleries and music venues here. There’s lots going on day and night – browse a gallery (many of which are free), grab a coffee or drink at one of the many funky cafes, or browse indie boutiques for unique fashion finds. At night, stay for some live music at one of the many bars and clubs offering free shows. 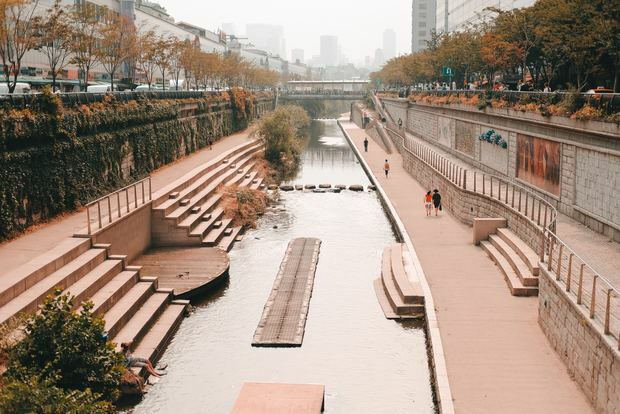 This 11-kilometre stream runs through the heart of downtown Seoul, starting at Cheonggye Plaza and passing under 22 bridges before flowing into the Hangang River. A walk along the stream is a good way to take a break from the fast pace of city life and, in addition to a tranquil way to pass a couple of hours, you can see some colourful street art and murals along the way, as well as a fountain and a small waterfall that is lit up at night. 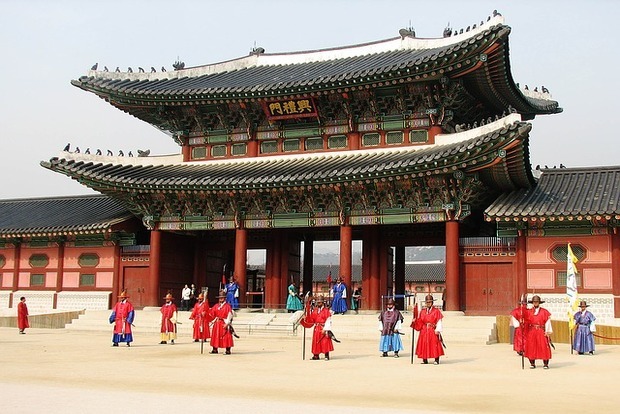 Gyeongbokgung Palace was built in 1395 and was the first royal palace built by the Joseon Dynasty. The largest of the Five Grand Palaces in Seoul (the others being Gyeonghuigung Palace, Deoksugung Palace, Changgyeonggung Palace, Changdeokgung Palace), Gyeongbokgung Palace is a sprawling complex well worth an afternoon of exploring the various courtyards, pavilions and gates on the premises. The entrance fee is 3000 won (around $3.40) and free 90-minute guided tours are offered daily in Chinese, English and Japanese. 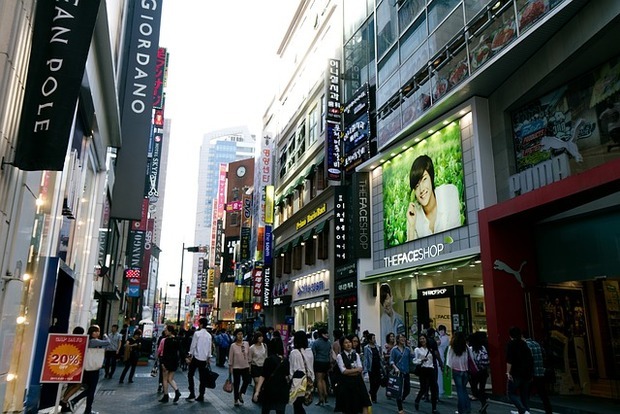 Ok, so shopping isn’t a free activity, but it really is worth checking out Seoul’s primary shopping neighbourhood for its vibrant atmosphere. The pedestrian-only area is lined with shops — both local and international brands — and if you’re into skincare and cosmetics there are stores aplenty to browse. The best part is, many of these beauty-focused stores are generous with samples (like free face masks) so you might end up with a pocketful of items to try out. If you want a less-hectic experience, go in the morning. If you do go in the later afternoon and evening, street food carts set up making it easy to grab a cheap meal. Speaking of shopping, Dongdaemun Market is a retail mecca and, like Myeongdong, even if you don’t want to reach into your wallet, it’s worth visiting just to look around. The word “market” doesn’t do the area justice as it’s home to 26 shopping malls, 30,000 specialty shops and 50,000 manufacturers. Almost anything you might need (or just want to look at) is likely to be found here and, if you do want to buy anything, prices are known to be very reasonable. If you’re looking to take home a few Korean fashion finds, you can find some good bargains. 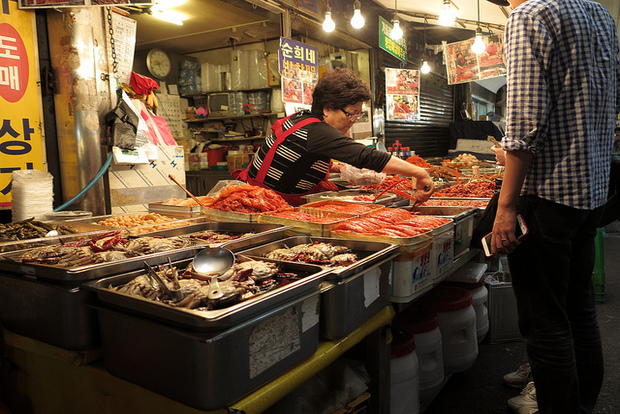 Bonus: When you get hungry, make your way to Dongdaemun’s famous food alley, Mukja Golmok, for cheap local eats. Get some fresh air and exercise by making your way up scenic Mount Namsan and exploring Namsan Park. There are several walking trails here and you can choose to either walk or take a cable car to the peak. The hike to the top is a moderate one and it does involve lots of stairs. A one-way trip on the cable car (if you want to ride up and walk down instead) will set you back 6000 won (around $6.70). 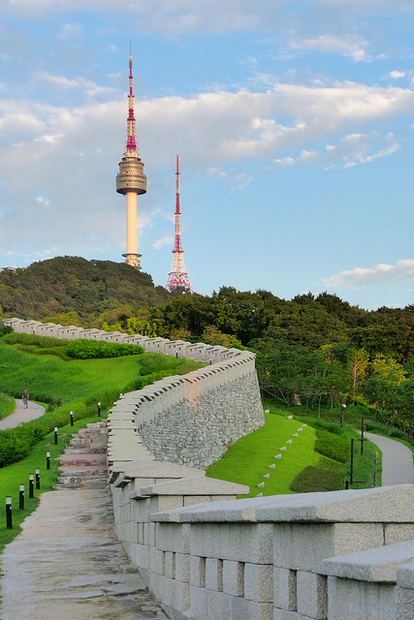 The views over the city are worth the hike (or the ride) and you can also check out a few other attractions while you’re in the area, including N Seoul Tower. 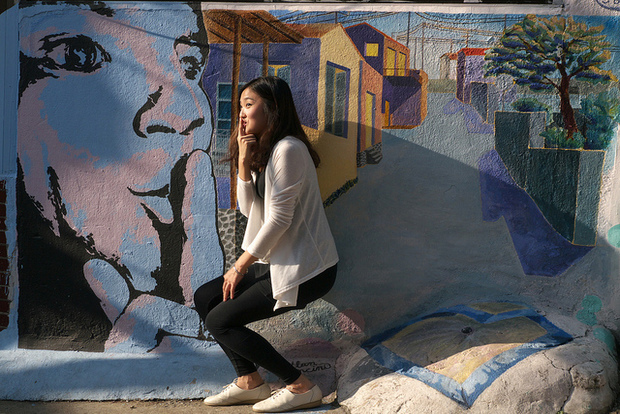 In an area that was once scheduled to be demolished, you can now find a totally unique attraction in Seoul known as Ihwa Mural Village. Located atop Mount Naksan, about a 10-minute walk uphill from the Daehakno area, this street art filled village is home to narrow lane ways covered in colourful and interesting murals, as well as painted staircases and metal sculptures. 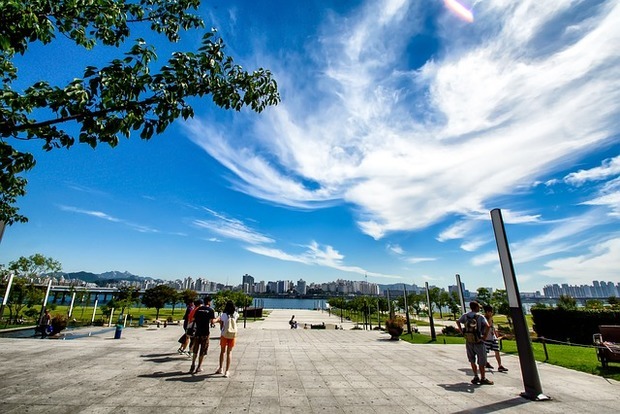 Whether you’re visiting for a few days or a few weeks, you can learn more about South Korea’s capital with a free walking tour organized by the City of Seoul. Tours include stops at a wide array of the city’s top attractions and cover everything from history and culture to architecture and markets. Tours are run by Seoul Cultural Tourism Volunteer Guides and take place in English, Chinese, Japanese and Korean. They run weekdays at 10 a.m. and 2 p.m. and on weekends at 10 a.m., 2 p.m. and 3 p.m. Simply sign up online and then get yourself to the starting point. If you’re craving culture on your trip to Seoul, there are several museums in the city you can visit at no cost. 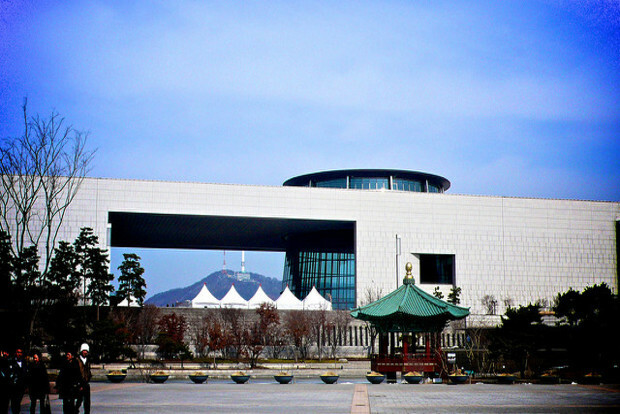 If you only have time for one, make it the National Museum of Korea, which is the largest museum in the country. The museum is home to a huge collection focused on Korean history and art and also close to scenic greenspace at Yongsan Family Park. Other free museums in Seoul include the War Memorial of Korea, the National Folk Museum of Korea and the Seoul Museum of History. 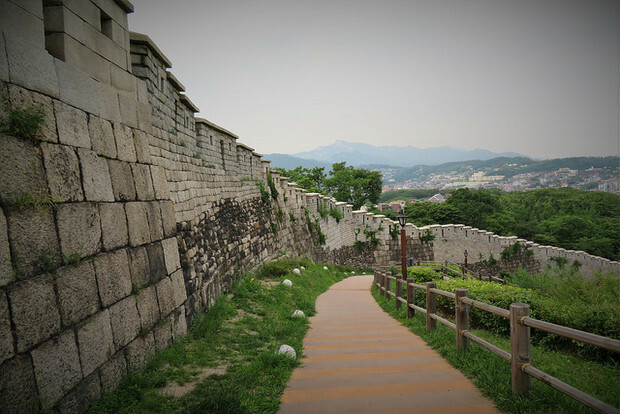 Now that you have your Seoul to-do list figured out, head to Cheapflights.ca to find the best flight to get you there. Any great cheap and free things we missed? Let us know in the comments below.